This year we provided game-based therapeutic services to around 40 kids each week across our five weekly social skills groups, and we hired and trained two new facilitators so that even more youth can receive services. Over the summer we offered game-based summer camps, incorporating craft and other enrichment activities, and led workshops instructing families how to discuss the role of video games in the home and how to successfully set safe and appropriate limits. Thanks to support from people like you, in 2018 we spoke to over 1000 people at conferences around the country about the benefits of games of all kinds, we provided training to over 400 medical and therapy professionals in the use of role-playing games for therapeutic growth, and provided one-on-one consultations to nearly two dozen individuals to assist the development of game-based programs in their own communities. We’ve offered guidance to individuals in seven countries around the world. We want to accomplish even more in 2019. We have projects that will only be brought to life with your support. We plan to expand programs even further, providing direct services to more youth across a larger area, and we plan to provide even more resources, materials, and training to support other professionals across the world. But that’s not all. Game to Grow’s services are currently focused on therapeutic social skills groups for youth, but our mission is broad and our aim is high. We have been coordinating with educators to provide school-based services using games to improve educational outcomes, build valuable 21st century skills, and reduce the impact of bullying. We are developing programs focusing on the use of games to help veterans and first-responders with PTSD, and to provide support services to incarcerated youth and adults. Your support is critical. With your donations even more individuals can receive the support they need, either in our direct services, or through our training and outreach programs. 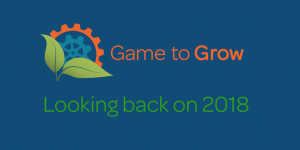 There are several great ways to support Game to Grow this holiday season. Please click hear to find out how you can help.